The final group game of the first stage of the prestigious South American Youth Championship between host nation Uruguay and Venezuela ended with some shady and unsavoury scenes that combined the playground with the pub league as La Celeste were denied a legitimate goal. Deep into stoppage-time, the referee committed a shameless U-turn following several minutes of vociferous Venezuelan protests, revoking from Uruguay what would have been an equaliser despite having previously signalled for the goal. What follows beneath the video of the events is a recounting of this farcical episode. Stoppage-time Fiasco at Uruguay vs Venezuela (U20s), 23 January 2015 (Video courtesy of YouTube user Elite Player). Venezuela went into the game having lost their three previous games and were already out of the competition, whereas their opponents possessed a 100% record and had arguably been the best side on display in either of the two groups. However, in a game contested largely by each nations’ second-string, La Vinotinto had been leading 1-0 courtesy of a first-half Jaime Moreno strike when they appeared to concede a late equaliser four minutes into stoppage-time. Their goalkeeper, Deportivo Petare’s Keiner Escorcia – who had up until that point been earning plaudits for his performance – completely misjudged a high, hanging cross, thus allowing Agustín Ale to nod the ball in. After conceding, Escorcia remained face down on the ground and so initial Uruguayan celebrations were put on ice as the referee, Bolivia’s Alejandro Mancilla, darted over to his assistant on the far touchline, where he soon found himself crowded by members of both teams. After some brief consultation, he signalled towards the half-way line with the universally understood gesticulation confirming the awarding of a goal. Unsurprisingly, this was met with jubilation by the Uruguayans close by, relieved as a loss in front of their compatriots appeared to have been averted. 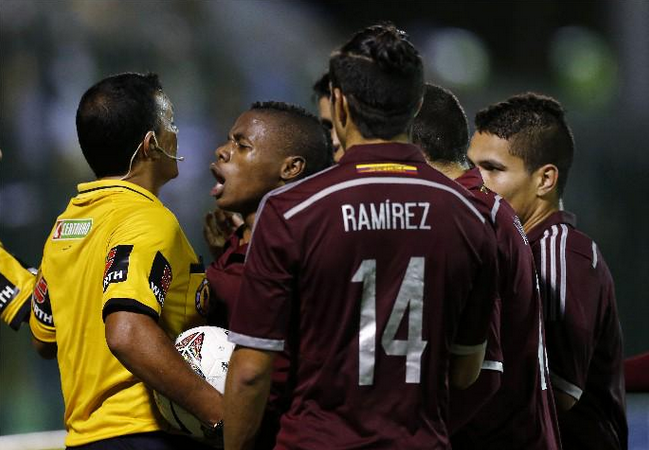 Referee Alejandro Mancilla confronted by Jhon Murillo and his Venezuelan team-mates (Image courtesy of Reuters). However, literally within a second the referee was furiously confronted by Venezuela’s Jhon Murillo, a man who has been nicknamed ‘Balotelli’ by his compatriots and not only for his appearance. The talented, if temperamental, livewire – who had been one of his team’s best performers – physically blocked the official’s atttempt to run back to the centre of the pitch for the restart, nearly clashing heads in the process. The Zamora FC forward then aggressively intimidated the referee Mancilla, incensed as he wildly gestured with his arms while releasing a seemingly relentless verbal diatribe. Two other officials soon also found themselves in a claustrophobic position in between the advertising hoardings and what was now nearly all of Venezuela’s outfield players, with Murillo as the ringleader. Some of his team-mates such as Rubén Ramírez, Franko Díaz and Carlos Sosa made attempts of varying conviction to restrain him though it never took long for him to find a way through the burgundy-bedecked bodies and back into the officials’ faces. However, though he was the leading protagonist, he was not alone in his actions, so riot police eventually had to step in to quell the situation and stop it from getting any uglier than it already was. In all, this segment of this elongated episode that took place by the far touchline lasted around three minutes, before the referee had managed to find a police-aided pathway through to the penalty area where he could inspect the origins of the Venezuelan players’ complaints. Here, Escorcia was still down with two of the backroom staff crouching over him. It had no doubt been alleged that he had been fouled by Ale before the Uruguayan’s header hit the back of the net and so the referee appeared to be checking on the goalkeeper’s condition. It did not take long for Venezuelan players to again surround him, though they appeared to have cooled down a few degrees. One, erstwhile peacemaker Ramírez, could be seen communicating with him with his hands over his mouth, though whether this is of any significance is impossible to tell at this stage. Two further minutes elapsed, at which point Escorcia had been gradually helped to his feet and, astoundingly, handed the ball by the referee to resume the game. The tone of the crowd’s noise suddenly changed and as soon as what must have been a free-kick was taken, the game was abruptly ended. Immediately, Uruguayans took their turn to encircle the referee, understandably angry as well as confused as everyone in the stadium and at home was at what the official scoreboard soon confirmed to be a barefaced reversal by a referee who had caved in under pressure. An increasingly volatile situation threatened to erupt, so it was to his credit that Uruguayan captain Gastón Faber opted against joining the rabble and instead stepped in to ensure that his team-mates did not completely lose their heads. Whilst the Danubio midfielder no doubt had an eye on avoiding suspensions for the final stage of the competition – something the Venezuelans had no reason to worry about – he nevertheless did an admirable job of taking some sting out of a potentially poisonous atmosphere and ensuring none of his compatriots descended to Murillo-levels of intimidation. Nevertheless, Uruguay can feel justifiably aggrieved as replays show beyond dispute that, rather than being fouled, Escorcia completely misjudged the dipping cross that Ale rose to head in. Whether or not he was seriously hurt on his way down is a separate issue, though it seems unlikely. Thus, it remains to be seen what, if any, punishments will be meted out on the Venezuelan players and the officials, though it would be a considerable surprise if at least Jhon Murillo and the referee avoid any disciplinary action. Ultimately, from a Venezuelan perspective, this fiasco did take some gloss off what was a much-improved performance following three straight defeats. However, coming at the end of their participation in a tournament in which they had received four red cards in as many games and frequently allowed ill-discipline to overshadow their talents, it was in many ways fitting. This entry was posted in South American Youth Football and tagged Academia Emeritense, Agustín Ale, Alejandro Mancilla, Ayrton Páez, Árbitro, Campeonato Sudamericano de Fútbol Sub-20, Campeonato Sudamericano Juvenil, Campeonato Sudamericano Sub-20 Juventud de América, Campeonato Sudamericano Sub-20 Juventud de América Uruguay 2015, Campeonato Sul-Americano Sub-20 Juventude da América Uruguay 2015, Caracas FC, Carlos Sosa, CONMEBOL, Dodgy refereeing, Dodgy referees, El Campeonato Sudamericano Sub-20, Estadio Domingo Burgueño, Franko Díaz, Gastón Faber, Giancarlo Maldonado, Jaime Moreno, Jhon Murillo, Keiner Escorcia, La Celeste, La Vinotinto, Player intimidation, Poor discipline, Referee bottling it, Referees, Ruben Ramírez, South America Youth Championship, South American football, South American future stars, South American talent, South American Youth Championship, Sudamericano Sub 20, SudamericanoSub20, Terrible refereeing, Uruguay, Venezuela, Vinotinto, Zamora FC on January 24, 2015 by hispanospherical.